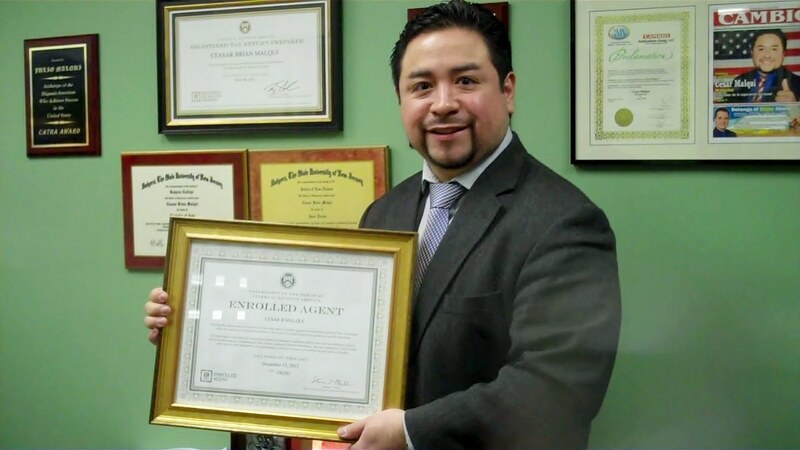 Ceasar B. Malqui with his Diploma as a new Enrolled Agent before the IRS. NEW JERSEY – The U.S. Department of the Treasury offered businessman Ceasar Malqui the new license that accredits him as an Enrolled Agent with Federal License for the Internal Revenue Service (IRS), which will permit him to act in all matters related to taxes in all 50 states across the nation. “The truth is I feel proud, because aside from a hard exam in three parts –for each one of which I had to study more than one month- the application process was long and lasted more than one year,” said Malqui from his office of Malqui Tax in the city of Paterson, New Jersey. Before being offered this important license, the applicant should pass through a background check -a period of rigorous review in all the aspects of his professional and individual path, as well as go through a series of interviews with the federal authorities. “Proudly, I was approved by the U.S. Department of the Treasury for the IRS,” expressed Malqui, who now adds a new title and triumph to his long list of accomplishments. It declares him a specialist and expert in taxes to represent and to fight for the rights of individuals and businesses before every division of the IRS, in the 50 states of the U.S. Among tax preparers, a very small group exists that achieves this important Federal License. The license permits him now to use in all his announcements the logo of “Enrolled Agent” offered by the IRS. He is also able to be identified with the federal initials E.A., R.T.R.P. added to his name Ceasar Brian Malqui. “I feel happy to continue a business path, initiated by my father Julio Malqui 37 years ago, with responsibility and care. This triumph does not only serve my professional development, but permits me to better serve the community and to defend their rights,” commented Federal Enrolled IRS Agent Malqui. “As I have expressed previously to my clients and friends, the process does not finish upon filing their taxes. It is necessary that there be a guarantee by the tax preparer whomever this is- to face every question or subsequent demand that the IRS may request,” added the businessman. He indicates that presently 30% of all the forms presented are submitted to an audit, review or examination, either by the IRS or State to verify the truth of the information presented. “There are many new regulations and changes each year regarding taxes and it is important to be up to date in all the changes of the tax code to be able to offer the client the maximum refund possible, with strong guarantees,” indicated finally Malqui, president of Malqui Tax, that is located on 469 21st Avenue in Paterson,New Jersey. For more information, call 1-888-829-3754. Call them or visit them. They are open 7 days a week with extended hours and are ready to help you file your personal or business taxes, resolve problems with the IRS or State and handle all your bookkeeping needs. addition the Nintendo Wii console. While the Ouya won’t directly compete in terms of graphics or power with either the Xbox 360 or PS3, the tiny console might be able to make a name for itself. OTON is capable of configuring and fine tuning game physics for new games at your command. you say it. You are making it entertaining and you still care for to stay it smart. advertising and *********** with Adwords. Anyway I’m adding this RSS to my email – erwinaugustine@zoho. com and could look out for a lot more from the exciting content. Be sure you update this yet again soon..